If you move into a house or apartment with multiple people, it can be difficult to split up rent — especially if everyone's rooms have different shapes, sizes and anoyances. This little tool will help you divvy the burden with no fuss. Student Jonathan Bittner created this project in an attempt to make rent splitting easier, especially among a large group of people. 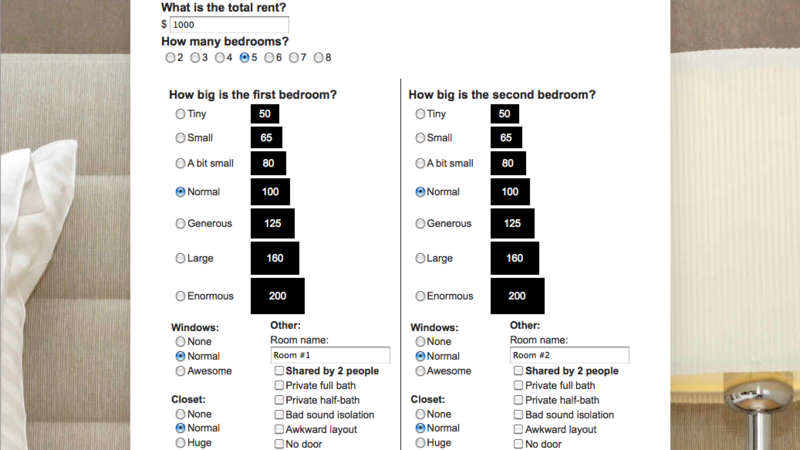 The calculator asks you a number of questions about the space and each of the bedrooms, like how big they are, what annoyances they may have (no door, awkward shapes, small closets), and calculates how much each person should pay based on that. Each bedroom annoyance or feature has a certain weight of importance, based on a rather in-depth survey he conducted asking people what the most important features are in renting a room. Check out the project's home page for more information, or just go straight to the calculator and give it a try.